Today's generation of mobile guests, business travelers, conference attendees and local residents, expect modern ways to connect with their hotels and engage the cities where they are traveling. Likewise, hoteliers know that satisfying the expectations of digitally-savvy guests directly correlates with increasing direct bookings, boosting service sales, improving satisfaction, and increasing TripAdvisor rankings. 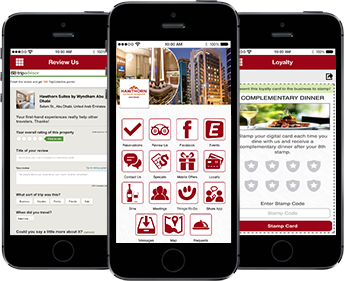 For only $49 /month Zuzapp provides hotels with a stunning property-branded mobile guest engagement, monetization and messaging app - no extra fees, no surprises! With Zuzapp, guests get more out of their stay and spend more on average with you, helping to increase your bottom line. Zuzapp enables hoteliers to affordably deliver an enhanced and differentiated experience for their guests before, during and after their stay. Schedule a 10 minute demo today and find out how you can uniquely deliver a Mobile, Local and Personal experience to your valued guests. Book Direct - improve bookings by aligning key events with stays and digitally prompting guests to make a reservation. Guest Messaging - improve guest satisfaction and recovery by allowing guests to make a request, share a concern and ask question that will enhance their stay. Push Notifications - enhance the guest experience by sending geo-targeted pop-up alerts to guests' smartphones. Call for Action - achieve your goals by prompting guests with a specific call-for-action i.e. book now, redeem offer, attend event, etc. Mobile Offers - increase average guest spend and boost satisfaction with compelling mobile push offers that keep guests and conference attendees on your property. TripAdvisor - increase reviews by digitally prompting guests to quickly and easily provide a review with one touch of a button. Room Service - easy ordering of food, drinks and hotel services. Loyalty Program -foster loyalty and reward guests for making frequent visits or purchases at the hotel, restaurant, spa and retail outlets. Viral Specials - Send promotions with incentives your customers want to share with their friends and colleagues, like specials, contests, and special events. Events - increase attendance by publishing and promoting events and activities directly to guests' smart devices. Hotel Facilities - increase guest spend with highly effective visual promotions of hotel, restaurants, spas, etc. Guest Directory - enhance the guest experience with local and personal information such as FAQs, hotel amenities, city attractions, dining, events, things-to-do, etc. Social Media - integrate with social networks such as Facebook, Twitter, Pinterest, YouTube, etc. Dynamic Back End Solution -web-based management system includes two-way staff and guest messaging and alerts, content and graphics management, and account management. Analytics - measure ROI with detailed reports on user downloads, user activity, offer redemption, etc. Compatible - with iPhones, iPads, Android smartphones and tablets. Pricing - at only $49 /month Zuzapp delivers the best value in the market with no set up fees, no hidden fees, no extra fees, no surprises. Check out our happy hotel customers.